Sunday Quote!- Creationism and Foundationalism | J.W. Wartick -"Always Have a Reason"
Every Sunday, I will share a quote from something I’ve been reading. The hope is for you, dear reader, to share your thoughts on the quote and related issues and perhaps pick up some reading material along the way! Here is one of the great insights of Osborn’s book: that Creationism is an epistemology. That is, it is a way of knowing as opposed to simply a position on what is to be known. I have found this to be the case in many discussions with young earth creationists. There simply is no such thing as evidence which can challenge the position. Rather, all things which purport to be said challenges are often seen as either deceptions of secular scientists or results of anti-Bible presuppositions. I think this is a very problematic position. What are your thoughts? Is YEC falsifiable–is it possible for it to be false? Does YEC turn into a way of knowing? Be sure to check out the page for this site on Facebook and Twitter for discussion of posts, links to other pages of interest, random talk about theology/philosophy/apologetics/movies and more! Book Review: “Death Before the Fall” by Ronald Osborn– I review Osborn’s book, outlining its contents while also providing some comments on its value. 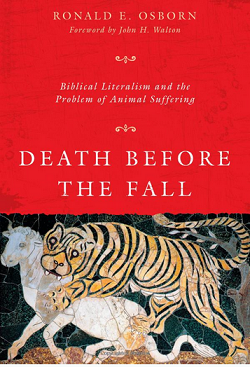 Ronald Osborn, Death Before the Fall: Biblical Literalism and the Problem of Animal Suffering (Downers Grove, IL: InterVarsit, 2014). *Yes, this is simplified. Want to dig in? Check out this article on the topic. I agree creationism is an epistemology in the sense it is a a priori assumption that is only then imposed on reality as if true. As a foundational belief, creationism as an epistemology is incompatible with the very method we call science. This is why creationism is often referred to as anti-science in that it cannot be modeled from compelling evidence adduced from reality but is used negatively by its adherents to try to undermine and misrepresent what we actually know about the world. Any evidence incompatible with this foundational creationism belief is (at some point) simply waved away… usually with a really poor ‘explanation’ that doesn’t work outside of its special privilege position afforded to it by its supporters. And therein lies the central problem: such an epistemology does not – cannot – will never – produce knowledge about the world we share. That’s not its purpose. Its purpose is to produce dogma… a dogma that is then used to mislead people – especially young people – away from a method that does produce knowledge (science) in the name of piety and militant allegiance to it. This is why evolution – a representation of incompatible science – is such a target that is so vociferously vilified by creationists… a fate avoided by all the other sources of compelling evidence that stands equivalently incompatible with creationism (such as geology, geography, chemistry, nuclear physics, anthropology, vulcanism, astrophysics, paleontology, and so on, all of which produce knowledge that is mutually supportive and demonstrable in applications, therapies, and technologies that actually work for everyone everywhere all the time). This reveals the imbedded hypocrisy of the YEC supporters: people are quite willing to happily use all the products of science that works for them without giving it a second thought but who then vilify the identical method because it produces knowledge of evolution contrary to an imposed and pious belief. Of course creationism is falsifiable in the sense that it has been demonstrated to be false at every turn. So why doesn’t everyone reject it? Well, it has nothing to do with it being true or false according to evidence and everything to do with religious belief invested in it. This is why creationism in all its forms is not science. It is a religious belief divorced from the reality it pretends to describe and because of this fact cannot produce knwoledge but can and does regularly produce beliefs contrary to knowledge. Absolutely. And not just the YEC crowd. Many of those committed to inerrancy assume their “plain reading” is inerrant. “God said it, I believe it, that settles it”. I want to ask them why they have both eyes (if they do). Have they never sinned with their eye? Shouldn’t they pluck it out? After all it’s not obvious that saying is metaphorical. The brilliant Origen castrated himself to avoid temptation. De facto, each man declares himself his own pope. I’m not a Catholic, but if I was to accept a Pope it would be one who might claim to sit in Peter’s seat, not someone who has anointed himself in his own bedroom. If God gave the Bible so that we wouldn’t have to think for ourselves, why did Jesus speak in parables? Charry, ‘Walking in the Truth: On Knowing God’, in Alan G. Padgett and Patrick R. Keifert (eds. ), But Is It All True? The Bible and the Question of Truth (Grand Rapids, Mich./Cambridge: Eerdmans, 2006), 145. Exchanging the truth for a lie: the immortal God for an allegedly true foundation which is actual just an idol. Now I’m not sure all creationists (and not all YECs) do this, but your argument is compelling on the face of it.